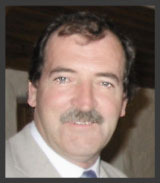 About Kenmare Coach and Cab - Taxis, Tours, Coaches, Buses, Mini-Buses, Wedding Cars and more. 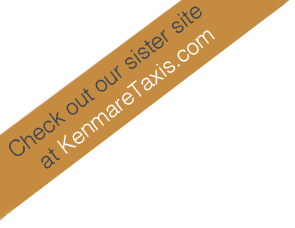 Kenmare Coach and Cab is a family run business providing transport in Kerry for over 70 years. From small beginnings in 1940 John Finnegan started business with a bicycle and a small rented shop. He soon purchased a car adding cabs and later mini-buses to his bicycle repair enterprise. Many years later his son Declan took over this side of the business and developed it into the thriving coach and cab company it is today. Declan also has another talent which has earned him the title of ‘The Singing Bus Driver. Kenmare Coach and Cab is now run by Declan and his wife Nora. With Irish tourist board qualified tour guides they provide tours of the Ring of Kerry, Ring of Beara, Glengariff/Garnish Island, tours and trips for individuals or groups of all sizes. They also cater for hill walkers, groups of landscape artists, historical/archaeological groups, as well as providing airport and luggage transfers, local taxis and wheelchair accessible taxis. "We thoroughly enjoyed our tour. Thank you for sharing your songs and stories with us Declan. It was the highlight of our trip to Kerry. We will definitly be returning next year to travel around The Ring of Beara as recommended, though the Ring of Kerry was truly stunning. We had a fantastic time." "We couldn't have asked for a better day, or a better tour guide! Highly recommended." Tours leave from outside Kenmare tourist office at 10am. All tours are subject to numbers. Phone bookings can be made anytime up to 9pm the previous night. Email bookings must be made at least 3 days in advance.